Partnering for Cures is an inspirational annual event focused on accelerating patient-centered solutions and creating meaningful collaborations. The event is sponsored by FasterCures, a Washington, D.C.-based Center of the Milken Institute, which has a singular goal – to save lives by speeding up and improving the medical research system. The Institute focuses on cutting through the roadblocks that slow medical progress by expanding the science of patient input, fostering policies to support biomedical innovation and spurring cross-sector collaboration in research to get better outputs. FasterCures engages all stakeholders across the medical enterprise to ensure the inclusion of multiple perspectives in addressing the most critical challenges in driving patient-focused medical solutions. Partnering for Cures conferences provide a vital mechanism to drive this collaboration. Bryan Pollard, President of Hyperacusis Research, participated in this year’s Partnering for Cures in Boston. This link outlines the full agenda and has the videos for many key talks. Enabling opportunities for collaboration is a key focus of the conference, and an online tool enabled face-to -ace meetings with attendees. Bryan took advantage of this and set up meetings to learn as much as possible to accelerate the work to find a cure for hyperacusis. In an opening panel on the topic, Laura Sol, Chief of Staff to the CEO, American Heart Association, described their approach to getting patient inputs. The AHA used a crowdsourcing approach for research priorities and determined that new areas of focus should include patients managing multiple health conditions and the need for an improved quality of life. Michael Goettler, Global President, Rare Disease, Pfizer, shared how Pfizer is working to get patient involvement from the beginning of development and how the company is working to understand the whole patient. Theresa Mullin, Director, Office of Strategic Programs, Center for Drug Evaluation and Research, U.S. F.D.A, describe the impact of Patient Advocacy Groups (PAGs) to drive prioritization of research efforts. In a personal discussion with Bryan, Theresa indicated that for rare conditions like hyperacusis, it is almost impossible to get any government funding for the condition without a PAG. This underscores the work that Hyperacusis Research is doing to fund seed grants and increase awareness of hyperacusis. 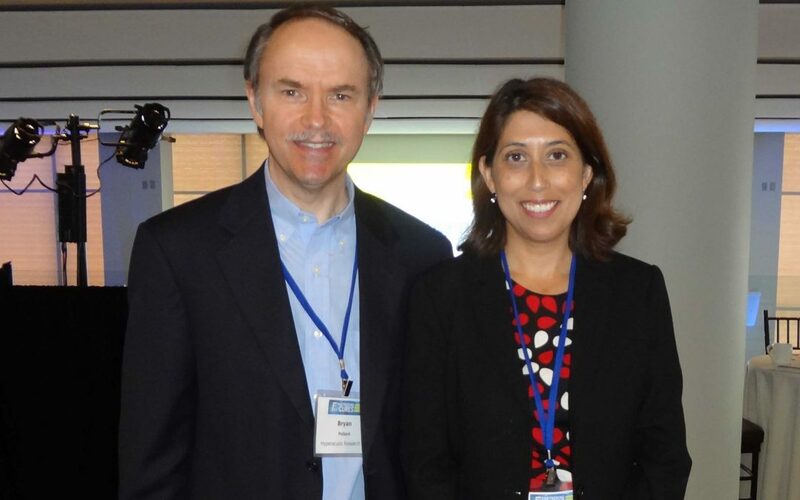 Bryan met with Sohini Chowdhury, Deputy CEO, The Michael J. Fox Foundation for Parkinson’s Research. The MJF Foundation has proven itself to be a game changer for the field of biomedical research. Sohini described the approaches for patient engagement the MJF foundation utilizes. First, the research effort clearly differentiates symptom treatment versus curing the disease. Many patient trials have been utilized for symptom treatment. By comparison, in clinical work on hyperacusis, symptom treatment is sometimes confused with eradicating hyperacusis. Sohini mentioned the need for a registry on the condition, which confirms our work with with Sanford CoRDS hyperacusis survey. Bryan was inspired by meeting with Tracy Dixon-Salazar of the Lennox-Gastaunt Syndrome (LGS) Foundation. Fifteen years ago, Tracy had never heard of epilepsy. Today, she has a Ph.D. in Neurobiology and works at an epilepsy research lab at the University of California-San Diego. Her achievement and accomplishment came at a price, however – Tracy’s daughter, Savannah, suffers from Lennox-Gastaut Syndrome, a childhood epilepsy. What began as an effort to read and learn more of her daughter’s condition became a pursuit of a college degree and then graduate school. Read the full story here. Tracy’s story is one that has parallels to those who have those who have children or relatives with hyperacusis and those who have hyperacusis themselves. It starts with understanding enough of the medical jargon to interact with researchers and help them grasp the nature of the condition. Next, it involves raising money to be able to fund and drive the research directly. It also involves forming alliances (such as the recently formed Hyperacusis Alliance) to drive strong researcher collaboration. Finally, an incredibly inspiring story was told by Dr. David Fajgenbaum, MD. David is Assistant Professor of Medicine at the University of Pennsylvania, co-founder/Executive Director of Castleman Disease Collaborative Network (CDCN), and a patient battling the same deadly disease–idiopathic multicentric Castleman disease (iMCD)–that he studies. See video here. David was diagnosed with iMCD during medical school. Between life-threatening relapses, David created the CDCN, which is a model for international collaboration to accelerate research for medical conditions (see figure). David’s research showed that the fundamental assumptions for the mechanism were wrong and that has changed the way iMCD is treated. Currently, he is in his longest remission ever thanks to a precision treatment that he identified, which had never been used for iMCD. David’s work has literally saved his own life as well as the lives of many others with Castleman’s disease. One of our missions is to connect patients with researchers. We started by adding the new category of “hyperacusis with pain” to the medical literature and defined the behavior of hyperacusis, with new cycles of pain readily set off with additional noise exposures. We are continuing with research looking into the biological mechanisms associated with pain which will lead to the discovery of how to stop the pain. FasterCures provides both inspiration and validation that we are on the right path but we need to work faster and smarter to help those who are suffering.